Kelley began receiving Easterseals services at a year old. 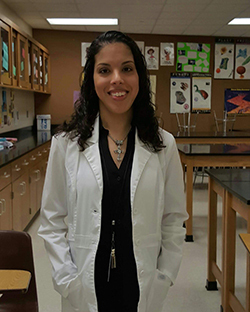 Kelley Elizondo stands at the front of her classroom proud of the hard work that led her there. 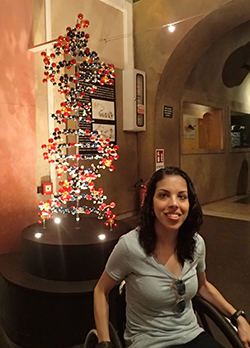 She is a dedicated high school biology and special education teacher, and a trusted confidante and role model for her students. But getting the job wasn’t easy, as Kelley repeatedly bumped up against barriers fueled by misconceptions about employing people with disabilities in her hometown of Houston, Texas. Kelley first met Easterseals long before her job search, when she was a year old, shortly after she was diagnosed with cerebral palsy. In fact, Kelley’s earliest memories are of Easterseals: Afternoons spent in therapy sessions; borrowing adapted toys for a week from the toy library; attending fundraisers. 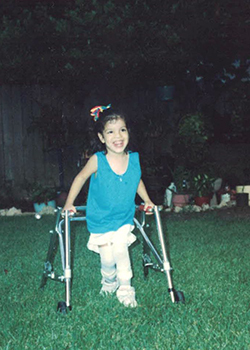 Then, years later, Kelley found Easterseals again when a teacher recommended the High School/High Tech program at Easterseals Greater Houston – an experience that would set the stage for Kelley’s first job and future career. Kelley has always been passionate about the sciences. “The people at Easterseals helped my development as a toddler, and then they went on to write my first paycheck,” she remembers with a smile. High School/High Tech gave Kelley the opportunity to go on field trips focused on exploring career fields in science and technology, she learned resume and interviewing skills, and she landed two paid internships funded by Easterseals – the first at a hospital and the second at NASA in the budget department for mission operations. Kelley knew she wanted to be a teacher since she was a little girl, but her passion for pursuing education as a career path was solidified when she was in the fifth grade and realized that she wasn’t being as challenged in her special education classes to the level at which she could excel. Her experiences would later go on to help her when relating to her own students. Six years after graduating from high school, Kelley triumphantly marched across the stage at the University of Houston with a Bachelor’s degree in special education with a certification to teach elementary school. But despite her qualifications and professional attitude, finding a job proved to be incredibly difficult. Kelley was discouraged but not ready to give up. Then in August 2013, one week before school started at Pasadena Memorial High School, she was called in for an interview for a teacher’s aide position. All throughout her interview, the principal listened intently, smiled, and asked thoughtful questions. At the end, he offered Kelley a job on the spot. A month later, she was offered a promotion to teach full-time. As a teacher, Kelley uses her own experiences to push her students to work towards their own goals. She challenges them and is an advocate for them. She is teaching them that they can overcome barriers and thrive in life after high school. Read more about our employment and training services, which span the United States. Watch: Cody is pursuing his dream to become a firefighter with the help of Easterseals.